Reagan Gomez- Preston (Zaria from The ParentHood) had a birthday party for her 3 year old daughter Scarlett complete with balloons, birthday hats, & shredded leggings... Wait... what did I just type?!! 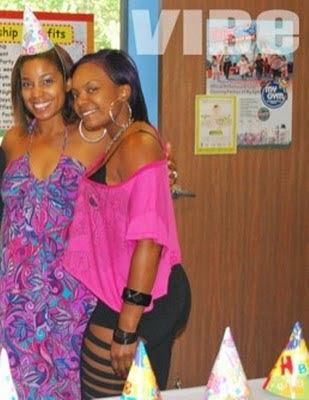 Who comes to a child's birthday party looking like they just left the pole @ Magic City?!! I dunno if this is her sister, cousin, best friend or whomever but this is a definite VIOLATION!! I'm not even gonna trip that THIS is the company Reagan keeps but I didn't get cast in her movie, all I'm saying is she needs better friends. UPDATE: I just noticed this heffas bra is out & the whole nine! !